HAZE NG1. KINOR J. GLORIA R.
This paper presents part of the development of an ongoing textile design research project titled The Creation of Interactive Textiles with Adoption of Environmental Sensitivity. The research attempts to integrate textile design creativity, interactive concepts, human perception theories and textile craftsmanship to create high value contemporary textiles. This paper showcases the process of the experimental trials combining thermo- and photo- sensitivities. The textile works with hybrid reactive property are capable to function as an interactive platform. With reference to the textile pieces created, a more in-depth investigation is proposed as the paper conclusion..
Harnisch M1. WOELFLING B. M1. CLASSEN E1. When doing endurance sports in summer one has to protect from UV radiation by sun cream or long sleeved clothing. On one hand, long sleeves protect against the IR radiation of the sun. On the other hand, the fabrics can show a negative effect on the heat release of the human body and wear comfort. 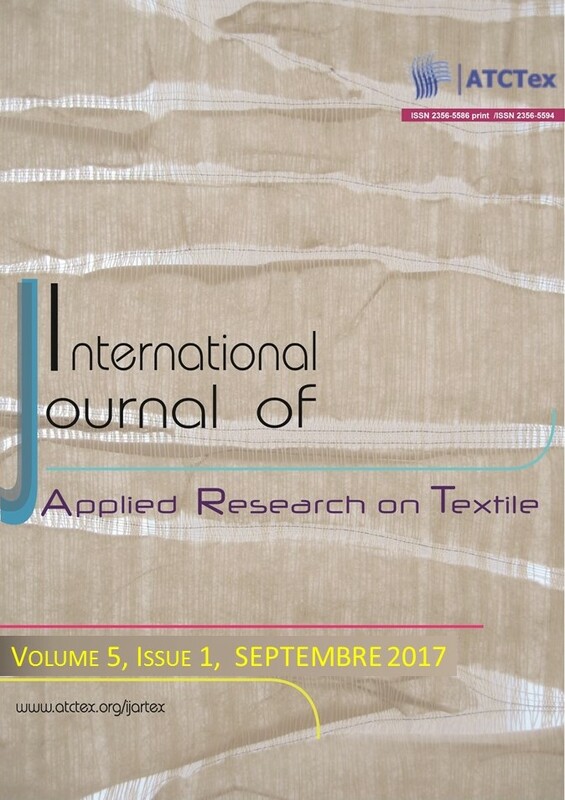 The correlation between textile construction, their wear comfort and their UV and IR protective properties is still unknown. Four fabrics were chosen as basis of the investigation. Two of them built a pair of similar fibre chemistry, but varied knit. Finishing encompassed different UV protection finishes and colours (white, red, black). The textiles were characterised in regards to UV standard 801 (UPF) and the IR protection according EN 410 (g-value). Furthermore, thermophysiological comfort and the sweat management were characterised by means of a sweating guarded-hotplate. Different sweat rates from vaporous to heavy sweating were simulated and according values were measured – water vapour resistance, buffering capacity of liquid and vaporous sweat, liquid sweat transport. Skin sensorial properties were characterised by means of five different indices - wet cling index, number of contact points, sorption index, surface index and stiffness..
HARNISCH M1. MAHR-ERHARDT A1. WOELFLING B. M1. CLASSEN E1. Climatic comfort is an important factor on comfort of working boots worn for long durations. Although, climatic comfort is influenced by the boot, the sock and their interaction, there are just few studies on the interaction of wearer/foot, sock and shoe. This study characterises heat and moisture management of 25 sock-boot combinations by means of a sweating foot manikin. Furthermore, results are discussed in regards to beneficial combinations providing high thermal comfort..
İÇOĞLU H. I1. OĞULATA O. R2. The effect of temperature(10 ºC-35 ºC, 5 ºC intervals) and relative humidity(20% -70%, 10% intervals) on the morphology of poly(ε-caprolactone) (PCL) electrospun nanofibers is investigated. Acetic acid/pyridine mixture is used as solvent. Surface morphologies and diameters of PCL nanofibers are examined by Field-emission scanning electron microscopy (FESEM). The average diameter of PCL nanofibers increases with increasing relative humidity (RH) at all temperatures. As the temperature increase, the average diameter of PCL nanofibers firstly increases then decreases at all RH values. The electrospun PCL nanofibers are circular shaped with smooth surface without bead formation for all RH and temperature values. .
El Ghali A1. HALLOUL S2. BAOUAB M. K. V1. 2National Engineering School of Monastir, University of Monastir,Tunisia. In this work, new wool-grafted-thiol (wool-g-t) chelating fibers were synthesized using sodium thiocyanate. The modified fibers were then loaded with Cu(II), Co(II) and Fe(III). The investigations into structural changes, which occurred during the modification of wool fibers followed by its binding to the metal ions, were performed using FTIR Spectroscopy analysis. Afterwards, batch adsorption tests were carried out with native wool (NW), wool-grafted-thiol (wool-g-t) chelating fibers and metal-wool-grafted-thiol (metal-wool-g-t) fibers in order to evaluate the adsorption efficiency of each adsorbent for the removal of AY 17 from aqueous solutions. During the batch experiments, the effects of temperature and type of adsorbent on dye uptake were investigated. Results were analyzed by the Langmuir, Freundlich and Jossens equations at different temperatures. The Jossens model was found to be in better correlation with the experimental data. The thermodynamic parameters were also calculated from the adsorption equilibrium measurements..